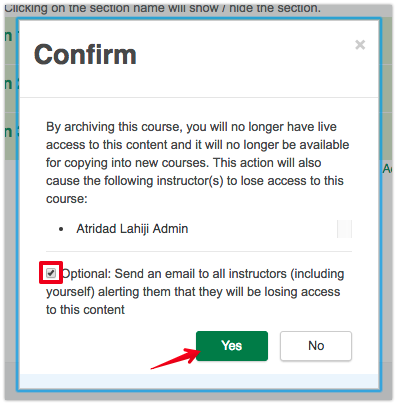 If you have been teaching in eClass for a number of years or are an administrator involved in numerous courses per term, you may wish to remove courses from your Course Overview list. You can now accomplish this easily through the self-serve archiving process available in the Course Management block. Note: This process is only available to course instructors and administrators. Students and other users are restricted to hiding any unwanted courses. 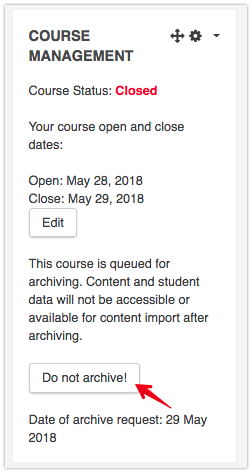 As a best practice for the ongoing maintenance and health of eClass and to reduce the numbers of available courses in your class lists, we are encouraging instructors to archive any old courses that they no longer require access to. Please be advised that if you use this process on a course, you will no longer be able to access the content from that course or be able to copy the content forward into new courses. This process affects all users in the course, so please ensure that you have informed and gathered consensus from all other course instructors before submitting a course for archiving. If you need to restore a course that has been archived, please contact IST eClass Support at eclass@ualberta.ca to initiate the manual restore process. Click Archive this course in the block. Note: If your course is from a past semester, you can click on Archive this course near the bottom center. Current and upcoming courses cannot be archived. To delete any current or upcoming courses, please contact IST eClass Support at eclass@ualberta.ca. If you are co-instructing your course, please note that it is your responsibility to inform all other course instructors that they will also be losing access to the course materials and that they will be unable to copy content from this course into new courses. Once you queue your course for archiving, it will be archived within 24 hours (the process runs over night). If you change your mind about archiving before the process runs, you can undo the removal by returning to the block and clicking Do not archive!.